Happy Presidents Day everyone! 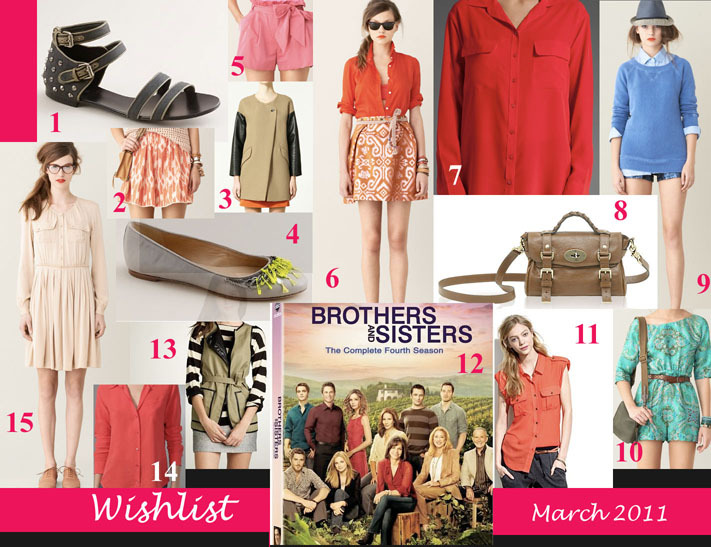 Here is my assorted Wishlist for March 2011. Many of the things are out of my price range (aka the Mini Alexa bag) but I plan to save up to buy it. It's actually not as ridiculously priced as the larger bags (seeing as it's much smaller). I was completely inspired by J. Crew's Spring lookbook this year, absolutely gorgeous. I can't wait for these things to come out, I'm going to be all over that website... or all over the sale once they go on it! I'm also really loving a bright pop of red for Spring as well, the Equipment blouses or Madewell blouse are definitely things I will be purchasing sometime in the future. I will need to buy one of them to brighten up my closest. The poppy and sangria colors are gorgeous and so bright for Spring, I love it. Plus you all know my love for Equipment blouses... what could be better. 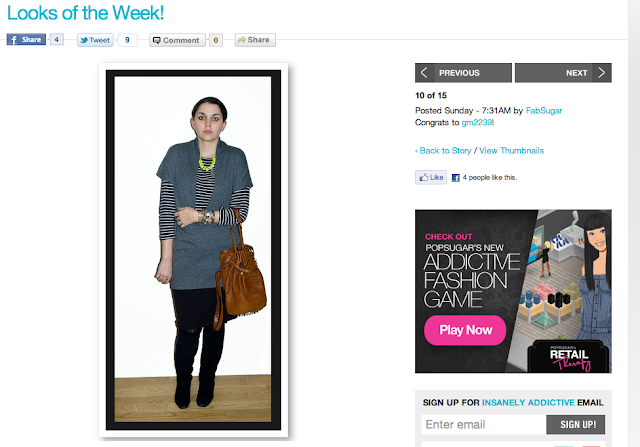 I was graciously selected to be in Fabsugar's Looks of the Week. Check out my look as well as the rest of the lovely ladies here. Once again it is snowing in NYC. Ugh... when will it ever stop? Last week it was 62 one day... such a tease! This weekends Brothers and Sisters, for those who saw, was pretty good. Unfortunately no Scotty, which was upsetting because I adore those Scotty/Kevin moments. I'll just have to wait until two weeks to see them again. The Joaquin storyline was funny, as was Nora's relationship with Brody... but I'd say that's about it in terms of highlights. For those of you who are off today... have a wonderful day off, relax and enjoy! #15 and # 8 are fabulous for spring. i want i want! please chekout the giveaway that i just posted! #6 is by far my favorite look. I love the laid back vibe, but also the femininity of the skirt. Great post!